Remove the SPAM from the can and slice into 5 even strips, slicing from lid side to bottom width wise. Place SPAM in frying pan and brown both sides. 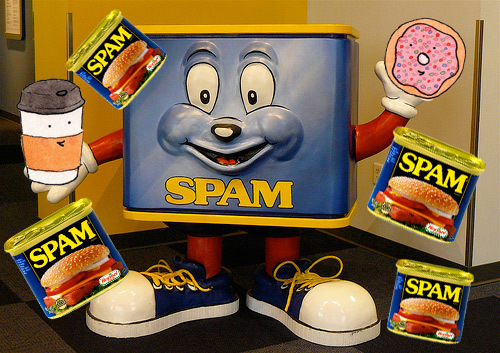 Let the SPAM cool. Use 1½ inch biscuit cutter and cut the SPAM to fit the doughnut pan (about 20 rings total). Then take a knife and cut out the center of the pieces so it can fit in the doughnut pan over the center dimple of the pan. Set aside. Take the leftover piece of SPAM and chop up and put back in the frying pan and crisp up the pieces and set aside. In a medium mixing bowl, whisk together flour, baking soda, and salt. In a large mixing bowl, beat together brown sugar, egg and melted butter until mixture is smooth. Beat in the flour mixture and ½ cup buttermilk. Stir only until all ingredients are combined. Scoop batter into a quart or gallon-sized plastic bag and chill for 1 hour. Preheat oven to 325 degrees and remove the bag from the refrigerator after batter has chilled. Spray a mini doughnut pan with non-stick cooking spray. Snip the corner off the plastic bag and pipe batter into mini donut cavities, filling each about 2/3 full. Place the SPAM Ring on top of the dough. Bake for 10 minutes, until doughnut springs back when lightly pressed. Turn doughnuts out to cool on a wire rack. Whisk the confectioners’ sugar, 1 tsp maple flavor, and 4 tsp buttermilk in a small bowl, adding the buttermilk as necessary to make the glaze thick enough to stick easily to the doughnuts. When doughnuts are completely cooled, dip tops of donuts in glaze. Top with the little pieces of fried SPAM.